Contrary to what has been said, and although proud to belong to the Arab world, Majida is Lebanese. Majida's family is from a city in South Lebanon called Tyr, which historically was the ancestor of the city of Carthage in Tunisia. Her grandfather had some business in Palestine where his family lived and built strong relations and friendships with the people over there. Later on, the family moved to Kfarshima, a small town to the south east of Beirut. The town has a quiet nature and a lovely atmosphere, probably two things that show in Majida's personality. As when you talk to Majida, you will be surprised by the difference between her on-stage character and her real personality. She is strong, dynamic and daring while singing; so quiet, shy and calm while talking. Kfarshima is also known for being a town of traditions and beliefs; in such an environment, Majida was raised on principles such as love, care and respect, and above all faith: believe in and trust God and rely on Him for His blessings and support. Majida is well known to be a devoted believer; she reads the holy books and prays every single day, but most importantly, she acts upon those beliefs; probably, that is why she is optimistic and always looking forward to a better future. In God, Majida finds her relief and salvation; that is demonstrated in the number of religious concerts she held and church masses she served, as well as the many religious songs she sang and released. Many people have come to identify Majida with 'Sufism'. Probably this goes back to the fact that Majida enjoys reading, and besides the Arabic poetry, she reads a lot of philosophy. That is clearly reflected in the way she comprehends things, deals with others and manages her life. When you sit and talk with her, you will think that you are in the presence of a thinker or a philosopher, and in any case, u will end up feeling comfortable with yourself, and most important, being more attached to that unique personality of hers. Despite being a devoted believer, Majida is not a religious fanatic; she admires all religions and their respective principles. She always repeats that back in Kfarshima, she used to wake up at dawn to listen to and enjoy the prayers coming from the nearby mosque, and there and then, she used to pray. Above all, Majida respects the human, as an entity of its own, and admires freedom regardless of one's own nationality, gender, age or race. Kfarshima is the hometown of many Lebanese singers, musicians, poets and writers, like the late Filimon Wehbi. Growing up in such an artistic environment and living in the house of Halim El Roumi (the very same person who discovered Fairouz), Majida's interest in music started to show at an early age when she used to listen to the works of the prominent figures of that time (Umm Kulthoum, Abd El Wahab, Asmahan...). She attracted the attention of her family and neighbors and began to sing as a hobby in front of them. One of the early songs she used to sing (and is actually saved on records) was a religious song called 'Your Birth' (Miladak). The jury was surprised with her performance and Majida was awarded First Place Award with excellence and distinction. The viewers were stunned by her strong crystal voice and unique self-trust; "from her first appearance, we fell in love with the tanned baby face and the long black hair" says one, while another comments "as soon as I heard her voice, I was drawn to sit in front of the screen and listen to her chant with admiration". Halim El Roumi couldn't continue saying No; he gave Majida his blessings to perceive singing as a mission and advice on how to respect and be respected and how important an education is, especially for an artist. But the civil war broke out in Lebanon in 1975, only a year before Majida could obtain her BA in Arabic Literature from the Lebanese University. Majida expresses her eagerness to go back to the university and finish her studies, even at this age and after this fame. On September 17, 1977, Majida got engaged to a businessman from Byblos (Jbeil). Since then, Antoine Dfouni has become the manager of Majida's work and her life partner. They were blessed with two daughters: Hala who is majoring in Interior Design at a university in Beirut and Nour who is still at school. Since the very first beginnings, Majida has drawn a clear-cut line between her work and her personal life. Although she is very picky in her songs and very demanding in her work (both of which require much time and attention), Majida gives priority to her family. The family is the center of her life and singing is something she likes to do. In reply to all talks and reports about her personal life, Majida says "I share my happiness with everyone, but I like to keep my sorrows for myself"; she holds a firm position when it comes to her family. That also explains Majida's deep sorrow and devastating reaction after the death of her sister, Maha. Shocked by the sudden illness of her sister, Majida did not what to do. She flew to her sister who was hospitalized in the United States and stayed near her for days. When she had to come back for a concert in Cairo, Majida dedicated a song for Maha, wishing a miracle would take place. Few days later, Majida made the hundreds gathered at a small church in Kfarshima to commemorate Maha, break into tears, with a heartbreaking poem that she wrote and recited. Months after Maha's death, Majida was still suffering the loss of her beloved sister. Not until she held several religious concerts and released a special song dedicated to Maha that Majida was able to 'come back'. 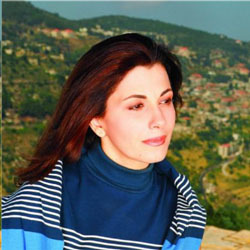 This clear separation between the public appearances and personal lies is probably the main reason why the general public has heard little, if anything about Majida; she tends to avoid the media and to reduce her public appearances in social and artistic gatherings, to an extent that some believe that Majida has a problem with the media and lacks friendships and social relations. As a matter of fact, Majida believes that when she has something new to say, she can come forward and say it through the media, but she does not like to repeat herself over and over again, as not to bore the public. For that, she is respected, and at the same time, sought among the media people. During the hardest years of the war in Lebanon, Majida didn't flee away; like the other millions, she endured the horrible incidents and events that occurred, and survived. She loves her country and devoted many songs to Lebanon, singing for rebirth, sovereignty, independence, peace and hope, ideals she strongly believes in, highly treasured and painfully paid for. Wherever she goes, she sings Lebanon, not a part of it, not a group, not a fraction… a nation she dreams of and lusts after: "if it is not going to be realized during our days, then let us help make it become real for our children" (1994). In her first song "I Dream of You, O'Lebanon" (3am I7lamak Ya 7ilm Ya Libnan), Majida was addressing a country which was under fire and destruction; she held her faith and love strong enough to dream of a Lebanon, the Phoenician bird which would be reborn. Through "Qana" (released in 1996 as a response on the Israeli massacre in South Lebanon), Majida presented to the whole world a clear Lebanese message: a message that was more firm than any other political or diplomatic letter. Majida affirmed that Lebanon would always be ready to fight for its rights and land and would never give in and accept any kind of humiliation and disregard. The song was so powerful in its meanings that Israeli Embassies in some Arab capitals had to protest and to request seizure of its broadcasting. However, Majida's Lebanese identity and her commitment to her country have not blocked out or reduced, to any degree, her love and concern to all other Arab countries. Majida has a very special place in her heart for Tunisia and Jordan, the two countries that have warmly and touchingly welcomed her, several times, on stage or away, people as well as governments. And despite the unfair rumors of the early 1990s, Egypt has done her more than good especially when Majida was honored with the presence of the President himself if a couple of her concerts, or when the Symphonic Orchestra of Cairo Opera has started to accompany her in many of her concerts. As for Palestine, Majida stood in front of 40 thousands in Beirut's Sports City on April 15, 2002 and said: "what is going now in Palestine is a crime against humanity, and I am here to say a final and forever NO for the Israeli occupation. To the Palestinians inside Palestine, I say, our hearts are with you… our souls are with you… Justice is with you… and the lands will always be yours". Later that tear, Majida sang 'Hal Tasma'een' (Do You Hear? ), a special song dedicated to Palestine; some says that Majida herself wrote the lyrics. You never know what is next with Majida El Roumi; she is a burning flame promising of more light. She has big dreams, for her country, her family and herself; but she never dreams of replacing Fairouz. Many people have been trying to ruin Majida's image by accusing her of seeking to take over Fairouz's glory. Majida thinks that Fairouz is not just a singer; 'Fairouz is rather a nation and she can't be replaced or repeated'. However, one can't deny that Majida El Roumi has conquered a leading place in the Arabic song. To many, she has become a symbol and idol. For all these reasons and many more, in October 16, 2001, United Nation's Food and Agriculture Organization choose Majida El Roumi as her honorable ambassadresses, to help in fighting hunger and stopping famine in the Arab World. Whether a diva, or an ambassadresses and regardless if elected as the 'Voice of Love' or 'Singer of the Arab conscience', Majida remains a simple human, a faithful wife, a caring mother and a true friend. No wonder why she refuses any proposed titles; "Majida El Roumi" is enough.